For centuries, the River Nile has been treated as a source of conflict rather than cooperation. This study explores past and present struggle between Egypt to maintain its control over the water of the Nile and other riparian countries that demand a more multilateral approach to fair and equitable utilization of the same. 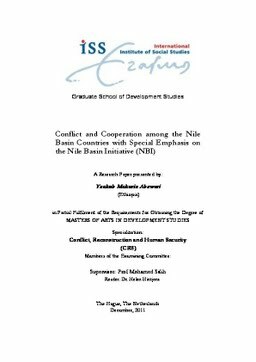 In the past, various attempts had been taken to establish basin-wide institutions specifically crafted to prevent conflict and manage competing interests over the utilization of the Nile River, but without success. Recently, the Nile Basin Initiative (NBI with established to formulate a new agreement on how to utilize the River Nile for the benefit of all riparian countries. The expectation is that by creating a permanent basin-wide agreement shift from conflictive behaviour to cooperative relationship amongst the riparian countries. In conducting this study, however, it became clear that the initiative yielded mixed results, involving both conflict and cooperation. Above all, signing of the Cooperative Framework Agreement (CFA) has escalated existing conflictive behaviours of the riparian states into ‘water war’ rhetoric. Following the CFA, scholars (Swain 2011, Gleick 1993, Swain 1997) have predicted that the failure of the NBI would lead the Nile riparian countries into water war. Nonetheless, a key finding of this study, considering from realist and liberalist perspective, has shown that resorting to water war is unrealistic to the Nile riparian countries; and hence they would not go to water war. Conversely, it found that NBI has managed to shift power relations from hydro-hegemony to a more multilateral approach of water utilization, where negotiation is the only way out to resolve the question of the Nile water. All things considered, this study has proved that conflict and cooperation in the Nile River basin actually coexists.